It is Card #199. It is in excellent condition in a top load holder. Player: Luke Kuechly. Team: Carolina Panthers. Year: 2014. Sport: Football. Player: Luke Kuechly. Year: 2014. You may have to wait to get a combined invoice if it did not combine automatically. Player: Sheldon Richardson, Luke Kuechly. Set: 2014 Elite Passing the Torch Silver. Year: 2014. An order with relic or autographed cards must use the padded envelope option. 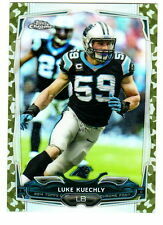 Player: Luke Kuechly. Set: 2014 Panini Contenders Playoff Ticket. Year: 2014. Manufacturer: Panini Group. Team: Carolina Panthers. 2014 Topps Valor Football Base Card Singles – You Choose!! 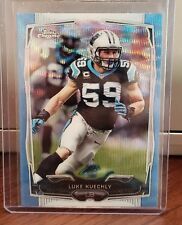 2014 Topps # 286 Luke Kuechly Gold Parallel # 1731/2014. Mint! 2013 PANINI CROWN ROYALE LUKE KUECHLY DIE CUT GOLD 72/99! CAROLINA PANTHERS! BC!